Maha Ganapathy Homam helps to remove what ever obstacles we are facing in our life or before starting any new venture (ex:starting new business or getting married,etc) or anything afresh. Performing Ganapathy Homam once in every year brings, prosperity, health, wealth and unity in family. Also this homa is recommened for the people undergoing through Kethu major period. 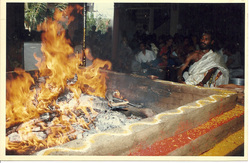 Maha Mrithyunjaya Homam is performed for longevity, to cure for chronic illness, for healthy life. It is edicated to Lord Shiva to avoid untimely death. Mrityu means death, Jaya means Victory. Thus Mrithyunjaya means victory over death. 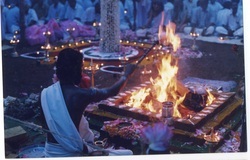 The prominent offerings in this homa are durva grass, Seasame seed, an herb called amrita, milk, Ghee and Cooked rice. The durva grass is famous for purifying blood. 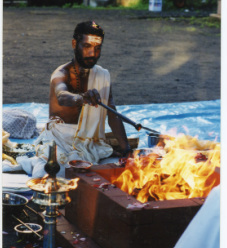 During this homa ingredients are offered 1008 times in the sacred fire chanting with mantras. It is very good to perform on our birthday. Maha Sudarsana homa is very powerful fire ceremony which performed to accomplish any task successfully, to protect ourself from troubles, to get rid of subtle evils forces, removal of negative energies, victory over enemies, to avoid accidents, peace and happiness. Navagraha Homam is performed to appease the nine planets i.e. the Sun, Moon, Mars, Mercury, Jupiter, Venus, Saturn, Rahu, and Ketu to reduce malefic effects, to remove obstacles, to attain longevity, for good health, to bring peace and happiness in our life. Bad times are attributed to the different Grahas (Planets) and their position in our natal chart. The Navagraha Homa is recommended for all, particularly for those horoscopes where planets are in detrimental or malefic positions. Nine varieties of flowers, nine cereals (Nava dhanya), nine vastrams (fabric of different colours), nine types of chamatas (twigs) and nine types of naivedyams are used in this homa. Lakshmi-Kubera Homam is performed for the purpose of gaining legitimate wealth. Those who are involved in business or are facing financial problems may perform this Homa to receive the blessings and grace of Goddess Lakshmi. Once in a year this homa is recommended for healthy living and long life. Conducting this homa once in a year it is essential for children in balarishta yoga and also if anyone suffering from any ailment for long then Ayush homa is recommended. This homa helps us to have positive relationships with our family and society, and it assists us in reaching high goals. Pitru Yagna is performed for the departed souls for peace of one's ancestors and to receive the blessings of ancestors. It is performed once in a year in the month of Aadi (July - August) on New Moon day or it is also performed 45th day or on the departed day of the soul. While entering a new house, as per the Vedic tradition, a Navagraha shanti and Vastu shanti homam is performed. This acts as a remedy for whatever malific influences are present in the house and removes the vastu doshas. The Sri Suktha Homam is a very powerful homam performed for ushering prosperity and wealth. Sri Suktha Homa can be conducted for those who are seeking wealth and prosperity in life. It is strongly recommended for those facing financial difficulties and wish to earn wealth in abundance. It is believed to bestow immense benefits to the performer of this homa. who wants to get married. 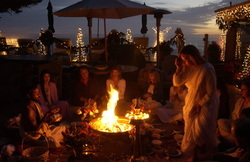 It also generates auspicious vibrations, which attract good alliances and ensure a happy marriage. This homa can also be performed to be blessed with children and to ensure longevity of your life-partner. Saraswati is the Goddess of leaming, knowledge, and wisdom. The Sanskrit word sara means "essence" and swa means "self." Thus Saraswati means "the essence of the self." Saraswati is represented in Hindu mythology as the divine consort of Lord Brahma, the Creator of the universe. She possesses the powers of speech, wisdom and learning. She has four hands representing four aspects of human personality in learning; mind, intellect, alertness and ego. Since knowledge is necessary for creation, Saraswati symbolizes the creative power of Brahma. Goddess Saraswati is worshipped by all persons interested in knowledge, especially students, teachers, scholars, and scientists. 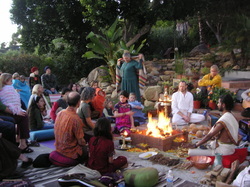 This yagna is performed on Special ocassions or on New years day to bring Peace and Love in everyones life. home please call on us at : (+1) 310 256 2320 or send us email srishiva125@yahoo.com.